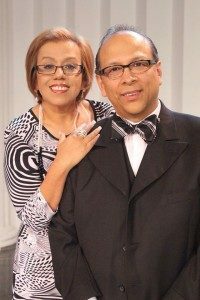 Eleazar Rodríguez, Jr. “aka JR” was born Youngstown, Ohio in 1962 where his parents pastored an Assemblies of God church. At a young age, he felt a strong call of God over his life. At the age of fifteen he went to study ministry in Mexico and graduated in 1979. In 1981, he became a minister with the General Council of the Assemblies of God. He has serviced as an Associate Pastor and a Youth Pastor. In 1988, he was elected to serve as the District Youth Director for the Gulf Latin American District of the Assemblies of God (GLAD) which at the time covered four states: Oklahoma, Louisiana, Arkansas, & Texas. While he served as the Youth Director, the doors of opportunity were opened to speak in youth and leadership conferences through the United States, Mexico, and Central & South America. In 1993, he resigned as the District Youth Director in order to become the pastor of Templo Aposento Alto in Houston, Texas where he is actively pastoring today. JR has also served on the committee for the Association of Evangelism for GLAD. In 1998, he was elected to serve as an Executive Presbyter for GLAD. In 2005, he was elected as the Superintendent for the East Regional Conference for the Gulf Latin American District Council of the Assemblies of God, which comprises of more than 100 churches and more than 200 pastors and ministers. Since 2010, he has served as the District Superintendent of the Texas Louisiana Hispanic District of the Assemblies of God. He has been associated with E.N.L.A.C.E., a Spanish affiliate of TBN, to produce television programming in Spanish for more than 55 countries in Latin America and 26 states in the United States. With weekly programming, there has been a reach of over 60 million people. JR has also been a part of the Trinity Broadcasting Network “Praise the Lord” program that is televised around the world and regularly participates on the network CET, also an affiliate of TBN. JR also wrote his first book entitled “Violent Generation” in English and in Spanish, published by Creation House. His ministry is also greatly complimented by his wife Patsy, who has her own solo album entitled “Be Real.” Coming from a divorced home, Patsy’s ministry through the Word, song, and personal testimony has brought healing and hope to many. His vision includes: building a Youth Center, My Friend’s House (apartments for the elderly and the needy), a Spanish Radio station, and a Christian Television in Spanish for the Houston area. JR and Patsy reside in Houston, Texas with their son Eleazar III, his wife Cynthia, baby Z and their son Joseph Ryan.